The pages that follow contain the required maintenanceservices determined by the engineers who designed yourvehicle. Besides those maintenance items specified in the fixedmaintenance schedule, there are other components whichmay require servicing or replacement in the future. • Failure to properly maintain your vehicle or performrepairs and service when necessary couldresult in more costly repairs, damage to othercomponents or negatively impact vehicle performance. Immediately have potential malfunctionsexamined by an authorized Chrysler Group LLCdealership or qualified repair center. • Your vehicle has been built with improved fluidsthat protect the performance and durability ofyour vehicle and also allow extended maintenanceintervals. Do not use chemical flushes in thesecomponents as the chemicals can damage yourengine, transmission, power steering or air conditioning. Such damage is not covered by the NewVehicle Limited Warranty. If a flush is neededbecause of component malfunction, use only thespecified fluid for the flushing procedure. To assure proper engine lubrication, the engine oil mustbe maintained at the correct level. Check the oil level atregular intervals, such as every fuel stop. The best time tocheck the engine oil level is about five minutes after afully warmed engine is shut off. Do not check oil levelbefore starting the engine after it has sat overnight. Checking engine oil level when the engine is cold willgive you an incorrect reading. Checking the oil while the vehicle is on level ground andonly when the engine is hot, will improve the accuracy ofthe oil level readings. Maintain the oil level between therange markings on the dipstick. Either the range markingsconsist of a crosshatch zone marked SAFE or acrosshatch zone marked with MIN at the low end of therange and MAX at the high end of the range. Adding onequart of oil when the reading is at the low end of therange marking will raise the oil level to the high end ofthe range marking. Do not overfill the engine. Overfilling the enginewill cause oil aeration, which can lead to loss of oilpressure and an increase in oil temperature. Thiscould damage your engine. The oil change indicator system will remind you that it istime to take your vehicle in for scheduled maintenance. NOTE: Under no circumstances should oil changeintervals exceed 6,000 miles (10 000 km) or six months,whichever occurs first. For best performance and maximum protection under alltypes of operating conditions, the manufacturer recommendsengine oils that are API Certified and meet therequirements of Chrysler Material Standard MS-6395. This symbol means that the oil hasbeen certified by the AmericanPetroleum Institute (API). Themanufacturer only recommendsAPI Certified engine oils. Do not use chemical flushes in your engine oil as thechemicals can damage your engine. Such damage isnot covered by the New Vehicle Limited Warranty. SAE 5W-20 engine oil is recommended for all operatingtemperatures. This engine oil improves low temperaturestarting and vehicle fuel economy. Your engine oil fillercap also shows the recommended engine oil viscosity foryour vehicle. The engine oil filler cap also shows the recommendedengine oil viscosity for your engine. For information onengine oil filler cap location, refer to “Engine Compartment”in “Maintaining Your Vehicle” for further information. Lubricants which do not have both the engine oil certificationmark and the correct SAE viscosity grade numbershould not be used. SAE 10W-30 engine oil is preferred for all operatingtemperatures. The engine oil filler cap also shows therecommended engine oil viscosity for your vehicle. Lubricants which do not have both, the engine oil certificationmark and the correct SAE viscosity grade numbershould not be used. You may use synthetic engine oils provided the recommendedoil quality requirements are met, and the recommendedmaintenance intervals for oil and filter changesare followed. The manufacturer strongly recommends against the additionof any additives (other than leak detection dyes) tothe engine oil. Engine oil is an engineered product andit’s performance may be impaired by supplementaladditives. Care should be taken in disposing of used engine oil andoil filters from your vehicle. Used oil and oil filters,indiscriminately discarded, can present a problem to theenvironment. Contact your authorized dealer, servicestation, or governmental agency for advice on how andwhere used oil and oil filters can be safely discarded inyour area. The engine oil filter should be replaced with a new filterat every engine oil change. All of this manufacturer’s engines have a full-flow typedisposable oil filter. Use a filter of this type for replacement. Only high quality filters should be used to assuremost efficient service. MOPAR engine oil filters are highquality oil filters and are recommended. The air induction system (air cleaner, hoses, etc.) canprovide a measure of protection in the case of enginebackfire. Do not remove the air induction system (aircleaner, hoses, etc.) unless such removal is necessaryfor repair or maintenance. Make sure that no one isnear the engine compartment before starting thevehicle with the air induction system (air cleaner,hoses, etc.) removed. Failure to do so can result inserious personal injury. The quality of replacement engine air cleaner filtersvaries considerably. Only high quality filters should beused to assure most efficient service. MOPAR engine aircleaner filters are high quality and are recommended. You will never have to add water, nor is periodic maintenancerequired. NOTE: The battery is stored in a compartment behindthe left front fender and is accessible without removingthe tire and wheel. Remote battery terminals are locatedin the engine compartment for jump-starting. Refer to_Jump-Starting Procedures” in “What To Do In Emergencies”for further information. To access the battery, turn the steering wheel fully to theright and remove the inner fender shield. • Battery fluid is a corrosive acid solution and canburn or even blind you. Do not allow battery fluidto contact your eyes, skin, or clothing. Do not leanover a battery when attaching clamps. If acidsplashes in eyes or on skin, flush the area immediatelywith large amounts of water. • Battery gas is flammable and explosive. Keepflame or sparks away from the battery. Do not usea booster battery or any other booster source withan output greater than 12 Volts. Do not allow cableclamps to touch each other. • Battery posts, terminals, and related accessoriescontain lead and lead compounds. Wash handsafter handling. • It is essential when replacing the cables on thebattery that the positive cable is attached to thepositive post and the negative cable is attached tothe negative post. Battery posts are marked positive(+) and negative (-) and are identified on thebattery case. Cable clamps should be tight on theterminal posts and free of corrosion. • If a “fast charger” is used while the battery is inthe vehicle, disconnect both vehicle battery cablesbefore connecting the charger to the battery. Donot use a “fast charger” to provide starting voltage. For best possible performance, your air conditionershould be checked and serviced by an authorized dealerat the start of each warm season. This service shouldinclude cleaning of the condenser fins and a performancetest. Do not use chemical flushes in your air conditioningsystem as the chemicals can damage your air conditioningcomponents. Such damage is not covered bythe New Vehicle Limited Warranty. • Use only refrigerants and compressor lubricantsapproved by the manufacturer for your air conditioningsystem. Some unapproved refrigerants areflammable and can explode, injuring you. Otherunapproved refrigerants or lubricants can causethe system to fail, requiring costly repairs. Refer toWarranty Information Book, located on the DVD,for further warranty information. • The air conditioning system contains refrigerantunder high pressure. To avoid risk of personalinjury or damage to the system, adding refrigerantor any repair requiring lines to be disconnectedshould be done by an experienced technician. R-134a air conditioning refrigerant is a hydrofluorocarbon(HFC) that is endorsed by the EnvironmentalProtection Agency and is an ozone-saving product. However,the manufacturer recommends that air conditioningservice be performed by authorized dealers or otherservice facilities using recovery and recycling equipment. NOTE: Use only manufacturer approved A/C SystemSealers, Stop Leak Products, Seal Conditioners, CompressorOil, and Refrigerants. Do not remove the A/C Air Filter while the blower isoperating or personal injury may result. 1. Open the glove box and remove all contents. 2. Push in on the sides of the glove box and lower thedoor. 3. Disconnect the glove box door dampener from the sloton the side of the box. This is done by grasping thedampener connector (on the outside of the box) and theend of the connector pin (on the inside of the box) withyour thumb and forefinger and pulling outward whilelightly lifting upward on the door with your other hand. Once disconnected, the dampener will retract underneaththe instrument panel if you release it. 4. Pivot the glove box downward. 5. Disengage the two retaining tabs that secure the filtercover to the HVAC housing and remove the cover. 6. Remove the A/C Air Filter by pulling it straight out ofthe housing. 7. Install the A/C Air Filter with the arrow on the filterpointing toward the floor. When installing the filtercover, make sure the retaining tabs fully engage thecover. The A/C Air Filter is labeled with an arrow toindicate airflow direction through the filter. Failureto install the filter properly will result in the need toreplace it more often. 8. Reinstall the glove box door dampener and glove box. Locks and all body pivot points, including such items asseat tracks, door hinge pivot points and rollers, liftgate,tailgate, sliding doors and hood hinges, should be lubricatedperiodically with a lithium based grease, such asMOPAR Spray White Lube or equivalent, to assurequiet, easy operation and to protect against rust andwear. Prior to the application of any lubricant, the partsconcerned should be wiped clean to remove dust andgrit; after lubricating excess oil and grease should beremoved. Particular attention should also be given tohood latching components to ensure proper function. When performing other underhood services, the hoodlatch, release mechanism and safety catch should becleaned and lubricated. The external lock cylinders should be lubricated twice ayear, preferably in the Fall and Spring. Apply a smallamount of a high quality lubricant, such as MOPAR Lock Cylinder Lubricant or equivalent directly into thelock cylinder. Clean the rubber edges of the wiper blades and thewindshield periodically with a sponge or soft cloth and amild non-abrasive cleaner or use the washer solvent. Thiswill remove accumulations of salt, waxes, or road filmand help reduce streaking and smearing. Operation of the wipers on dry glass for long periodsmay cause deterioration of the wiper blades. Always usewasher fluid when using the wipers to remove salt or dirtfrom a dry windshield. Avoid using the wiper blades to remove frost or ice fromthe windshield. Make sure that they are not frozen to theglass before turning them on to avoid damaging theblade. Keep the blade rubber out of contact with petroleumproducts such as engine oil, gasoline, etc. NOTE: Life expectancy of wiper blades varies dependingon geographical area and frequency of use. Poorperformance of blades may be present with chattering,marks, water lines or wet spots. If any condition ispresent please proceed to clean wiper blades with humidcloth removing any debris that may be affecting itsfunction. The fluid reservoir for the windshield washers is locatedin the engine compartment. Be sure to check the fluidlevel in the reservoir at regular intervals. Fill the reservoirwith windshield washer solvent (not radiator antifreeze)and operate the system for a few seconds to flush out theresidual water. Commercially available windshield washer solventsare flammable. They could ignite and burn you. Caremust be exercised when filling or working aroundthe washer solution. If you notice a change in the sound of the exhaust system;or if the exhaust fumes can be detected inside the vehicle;or when the underside or rear of the vehicle is damaged;have an authorized technician inspect the complete exhaustsystem and adjacent body areas for broken, damaged,deteriorated, or mispositioned parts. Open seamsor loose connections could permit exhaust fumes to seepinto the passenger compartment. In addition, inspect theexhaust system each time the vehicle is raised for lubricationor oil change. Replace as required. • Exhaust gases can injure or kill. They containcarbon monoxide (CO), which is colorless andodorless. Breathing it can make you unconsciousand can eventually poison you. To avoid breathingCO, refer to “Safety Tips/Exhaust Gas” in “ThingsTo Know Before Starting Your Vehicle” for furtherinformation. • A hot exhaust system can start a fire if you parkover materials that can burn. Such materials mightbe grass or leaves coming into contact with yourexhaust system. Do not park or operate your vehiclein areas where your exhaust system cancontact anything that can burn. • The catalytic converter requires the use of unleadedfuel only. Leaded gasoline will destroy theeffectiveness of the catalyst as an emissions controldevice and may seriously reduce engine performanceand cause serious damage to the engine. • Damage to the catalytic converter can result if yourvehicle is not kept in proper operating condition. In the event of engine malfunction, particularlyinvolving engine misfire or other apparent loss ofperformance, have your vehicle serviced promptly. Continued operation of your vehicle with a severemalfunction could cause the converter to overheat,resulting in possible damage to the converter andvehicle. Under normal operating conditions, the catalytic converterwill not require maintenance. However, it is importantto keep the engine properly tuned to assureproper catalyst operation and prevent possible catalystdamage. NOTE: Intentional tampering with emissions controlsystems can result in civil penalties being assessedagainst you. In unusual situations involving grossly malfunctioningengine operation, a scorching odor may suggest severeand abnormal catalyst overheating. If this occurs, stopthe vehicle, turn off the engine and allow it to cool. Service, including a tune-up to manufacturer’s specifications,should be obtained immediately. • Do not shut off the engine or interrupt the ignition,when the transmission is in gear and the vehicle is inmotion. • Do not try to start the engine by pushing or towing thevehicle. • Do not idle the engine with any spark plug wiresdisconnected or removed, such as when diagnostictesting, or for prolonged periods during very roughidle or malfunctioning operating conditions. • When working near the radiator cooling fan, disconnectthe fan motor lead or turn the ignitionswitch to the LOCK position. The fan is temperaturecontrolled and can start at anytime the ignitionswitch is in the ON position. • You or others can be badly burned by hot enginecoolant (antifreeze) or steam from your radiator. Ifyou see or hear steam coming from under thehood, do not open the hood until the radiator hashad time to cool. Never try to open a coolingsystem pressure cap when the radiator is hot. Check engine coolant (antifreeze) protection every12 months (before the onset of freezing weather, whereapplicable). If the engine coolant (antifreeze) is dirty orrusty in appearance, the system should be drained,flushed, and refilled with fresh engine coolant (antifreeze). Check the front of the A/C condenser for anyaccumulation of bugs, leaves, etc. If dirty, clean by gentlyspraying water from a garden hose vertically down theface of the condenser. Check the coolant recovery bottle tubing for brittle rubber,cracking, tears, cuts, and tightness of the connectionat the bottle and radiator. Inspect the entire system forleaks. If the engine coolant (antifreeze) is dirty or contains aconsiderable amount of sediment, clean and flush with areliable cooling system cleaner. Follow with a thoroughrinsing to remove all deposits and chemicals. Properlydispose of the old engine coolant (antifreeze). Use only the manufacturer’s recommended coolant. Referto “Fluids, Lubricants, and Genuine Parts” in “MaintainingYour Vehicle” for further information. • Mixing of engine coolant (antifreeze) other thanspecified HOAT engine coolant (antifreeze), mayresult in engine damage and may decrease corrosionprotection. If a non-HOAT engine coolant(antifreeze) is introduced into the cooling systemin an emergency, it should be replaced with thespecified engine coolant (antifreeze) as soon aspossible. • Do not use water alone or alcohol-based enginecoolant (antifreeze) products. Do not use additionalrust inhibitors or antirust products, as theymay not be compatible with the engine coolant(antifreeze) and may plug the radiator. • This vehicle has not been designed for use withPropylene Glycol based engine coolant (antifreeze). Use of Propylene Glycol based enginecoolant (antifreeze) is not recommended. Your vehicle has been built with an improved enginecoolant (antifreeze) that allows extended maintenanceintervals. This engine coolant (antifreeze) can be used upto five years or 102,000 miles (170 000 km) beforereplacement. To prevent reducing this extended maintenanceperiod, it is important that you use the sameengine coolant (antifreeze) throughout the life of yourvehicle. • The manufacturer recommends using MOPAR Antifreeze/Coolant 5 Year/100,000 Mile FormulaHOAT (Hybrid Organic Additive Technology) orequivalent. • Mix a minimum solution of 50% HOAT engine coolantand distilled water. Use higher concentrations (not toexceed 70%) if temperatures below 34°F ( 37°C) areanticipated. • Use only high purity water such as distilled or deionizedwater when mixing the water/engine coolant(antifreeze) solution. The use of lower quality waterwill reduce the amount of corrosion protection in theengine cooling system. Please note that it is the owner’s responsibility to maintainthe proper level of protection against freezing accordingto the temperatures occurring in the area wherethe vehicle is operated. NOTE: Mixing engine coolant (antifreeze) types willdecrease the life of the engine coolant (antifreeze) andwill require more frequent coolant changes. The cap must be fully tightened to prevent loss of enginecoolant (antifreeze), and to ensure that the engine coolant(antifreeze) will return to the radiator from the coolantrecovery bottle. The cap should be inspected and cleaned if there is anyaccumulation of foreign material on the sealing surfaces. • The warning words “DO NOT OPEN HOT” onthe cooling system pressure cap are a safety precaution. Never add engine coolant (antifreeze)when the engine is overheated. Do not loosen orremove the cap to cool an overheated engine. Heatcauses pressure to build up in the cooling system. To prevent scalding or injury, do not remove thepressure cap while the system is hot or underpressure. • Do not use a pressure cap other than the onespecified for your vehicle. Personal injury or enginedamage may result. Used ethylene glycol based engine coolant (antifreeze) isa regulated substance requiring proper disposal. Checkwith your local authorities to determine the disposalrules for your community. To prevent ingestion by animalsor children, do not store ethylene glycol basedengine coolant (antifreeze) in open containers or allow itto remain in puddles on the ground. If ingested by a childor pet, seek emergency assistance immediately. Clean upany ground spills immediately. Four-Cylinder Engines – the coolant bottle provides aquick visual method for determining that the enginecoolant (antifreeze) level is adequate. With the engineidling and warm to normal operating temperature, thelevel of the engine coolant (antifreeze) in the bottleshould be between the “ADD” and “FULL” lines, shownon the bottle. Six-Cylinder Engines – the level of the engine coolant(antifreeze) in the pressurized coolant bottle should bebetween the “COLD” and “FULL” range on the bottlewhen the engine is cold. The radiator normally remains completely full, so there isno need to remove the radiator cap unless checking forengine coolant (antifreeze) freeze point or replacing coolant. Advise your service attendant of this. As long as theengine operating temperature is satisfactory, the coolantbottle need only be checked once a month. When additionalengine coolant (antifreeze) is needed to maintainthe proper level, it should be added to the coolant bottle. NOTE: When the vehicle is stopped after a few miles(kilometers) of operation, you may observe vapor comingfrom the front of the engine compartment. This is normallya result of moisture from rain, snow, or highhumidity accumulating on the radiator and being vaporizedwhen the thermostat opens, allowing hot enginecoolant (antifreeze) to enter the radiator. If an examination of your engine compartment shows noevidence of radiator or hose leaks, the vehicle may besafely driven. The vapor will soon dissipate. • Do not overfill the coolant recovery bottle. • Check engine coolant (antifreeze) freeze point in theradiator and in the coolant recovery bottle. If enginecoolant (antifreeze) needs to be added, the contents ofthe coolant recovery bottle must also be protectedagainst freezing. • If frequent engine coolant (antifreeze) additions arerequired, or if the level in the coolant recovery bottledoes not drop when the engine cools, the coolingsystem should be pressure tested for leaks. • Maintain engine coolant (antifreeze) concentration at50% HOAT engine coolant (antifreeze) (minimum)and distilled water for proper corrosion protection ofyour engine, which contains aluminum components. • Make sure that the radiator and coolant recoverybottle overflow hoses are not kinked or obstructed. • Keep the front of the radiator clean. If your vehicle isequipped with air conditioning, keep the front of thecondenser clean. • Do not change the thermostat for Summer or Winteroperation. If replacement is ever necessary, installONLY the correct type thermostat. Other designs mayresult in unsatisfactory cooling performance, poor gasmileage, and increased emissions. In order to assure brake system performance, all brakesystem components should be inspected periodically. Riding the brakes can lead to brake failure andpossibly an accident. Driving with your foot restingor riding on the brake pedal can result in abnormallyhigh brake temperatures, excessive lining wear, andpossible brake damage. You would not have your fullbraking capacity in an emergency. Check the fluid level in the master cylinder immediatelyif the brake system warning light indicates system failure. Check the fluid level in the master cylinder when performingunderhood services. Clean the top of the master cylinder area before removingthe cap. If necessary, add fluid to bring the fluid level upto the requirements described on the brake fluid reservoir. Overfilling of fluid is not recommended because it maycause leaking in the system. Fluid level can be expected to fall as the brake pads wear. Brake fluid level should be checked when pads arereplaced. However, low fluid level may be caused by aleak and a checkup may be needed. Use only manufacturer’s recommended brake fluid. Referto “Fluids, Lubricants, and Genuine Parts” in “MaintainingYour Vehicle” for further information. • Use only manufacturer’s recommended brakefluid. Refer to “Fluids, Lubricants, and GenuineParts” in “Maintaining Your Vehicle” for furtherinformation. Using the wrong type of brake fluidcan severely damage your brake system and/orimpair its performance. The proper type of brakefluid for your vehicle is also labeled on the originalfactory installed hydraulic master cylinderreservoir. • To avoid contamination from foreign matter ormoisture, use only new brake fluid or fluid thathas been in a tightly closed container. Keep themaster cylinder reservoir cap secured at all times. Brake fluid in a open container absorbs moisturefrom the air resulting in a lower boiling point. This may cause it to boil unexpectedly during hardor prolonged braking, resulting in sudden brakefailure. This could result in a accident. • Overfilling the brake fluid reservoir can result inspilling brake fluid on hot engine parts, causingthe brake fluid to catch fire. Brake fluid can alsodamage painted and vinyl surfaces, care should betaken to avoid its contact with these surfaces. • Do not allow petroleum based fluid to contaminatethe brake fluid. Brake seal components couldbe damaged, causing partial or complete brakefailure. This could result in an accident. The automatic transmission and differential assembly arecontained within a single housing. The fluid level in the automatic transmission should bechecked whenever the vehicle is serviced. Operation withan improper fluid level will greatly reduce the life of thetransmission and the fluid. 2. Run the engine at curb idle speed for a minimum of60 seconds. 3. Apply the parking brake fully. 4. Place the shift lever momentarily into each gear positionending with the lever in PARK. 5. Wipe the area around the dipstick clean to eliminatethe possibility of dirt entering the transmission. 6. Remove the dipstick and determine if the fluid is hotor cold. Hot fluid is approximately 180°F (82° C), whichis the normal operating temperature after the vehicle isdriven at least 15 miles (24 km). Hot fluid cannot be heldcomfortably between the fingertips. Cold fluid is at atemperature below 80°F (27° C). 7. Wipe the dipstick clean and reinsert until seated. Then,remove dipstick and note the reading. a. If the fluid is hot, the reading should be in thecrosshatched area marked “HOT” (between the uppertwo holes in the dipstick). b. If the fluid is cold, the fluid level should be betweenthe lower two holes in the area marked “COLD.”If the fluid level is low, add sufficient fluid through thefiller (dipstick) tube to bring it to the proper level. Do notoverfill. • Using a transmission fluid other than the manufacturer’srecommended fluid may cause deteriorationin transmission shift quality and/or torqueconverter shudder. Using a transmission fluidother than that recommended by the manufacturerwill result in more frequent fluid and filterchanges. Refer to “Fluids, Lubricants, and GenuineParts” in “Maintaining Your Vehicle” for furtherinformation. • Dirt and water in the transmission can causeserious damage. To prevent dirt and water fromentering the transmission after checking or replenishingfluid, make certain that the dipstick cap isre-seated properly. The automatic transmission has no dipstick and is dealerserviced only. In addition, change the fluid and filter if the transmissionis disassembled for any reason. Automatic Transmission Fluid (ATF) is an engineeredproduct and its performance may be impaired by supplementaladditives. Therefore, do not add any fluid additivesto the transmission. The only exception to thispolicy is the use of special dyes to aid in detecting fluidleaks. In addition, avoid using transmission sealers asthey may adversely affect seals. Do not use chemical flushes in your transmission asthe chemicals can damage your transmission components. Such damage is not covered by the NewVehicle Limited Warranty. Vehicle body care requirements vary according to geographiclocations and usage. Chemicals that make roadspassable in snow and ice and those that are sprayed ontrees and road surfaces during other seasons are highlycorrosive to the metal in your vehicle. Outside parking,which exposes your vehicle to airborne contaminants,road surfaces on which the vehicle is operated, extremehot or cold weather and other extreme conditions willhave an adverse effect on paint, metal trim, and underbodyprotection. The following maintenance recommendations will enableyou to obtain maximum benefit from the corrosionresistance built into your vehicle. Corrosion is the result of deterioration or removal ofpaint and protective coatings from your vehicle. • Wash your vehicle regularly. Always wash your vehiclein the shade using MOPAR CarWash or equivalent,or a mild car wash soap, and rinse the panelscompletely with clear water. • If insects, tar, or other similar deposits have accumulatedon your vehicle, use MOPAR Super Kleen Bugand Tar Remover or equivalent to remove. • Use a high quality cleaner wax, such as MOPAR Cleaner Wax or equivalent to remove road film, stainsand to protect your paint finish. Take care never toscratch the paint. • Avoid using abrasive compounds and power buffingthat may diminish the gloss or thin out the paintfinish. • Do not use abrasive or strong cleaning materialssuch as steel wool or scouring powder, which willscratch metal and painted surfaces. • Use of power washers exceeding 1,200 psi(8 274 kPa) can result in damage or removal ofpaint and decals. • If you drive on salted or dusty roads or if you drivenear the ocean, hose off the undercarriage at least oncea month. • It is important that the drain holes in the lower edgesof the doors, rocker panels, and trunk be kept clearand open. • If you detect any stone chips or scratches in the paint,touch them up immediately. The cost of such repairs isconsidered the responsibility of the owner. • If your vehicle is damaged due to an accident orsimilar cause which destroys the paint and protectivecoating, have your vehicle repaired as soon as possible. The cost of such repairs is considered the responsibilityof the owner. • If you carry special cargo such as chemicals, fertilizers,de-icer salt, etc., be sure that such materials are wellpackaged and sealed. • If a lot of driving is done on gravel roads, considermud or stone shields behind each wheel. 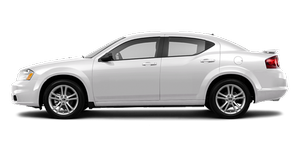 • Use MOPAR Touch Up Paint or equivalent onscratches as soon as possible. Your authorized dealerhas touch up paint to match the color of your vehicle. All wheels and wheel trim, especially aluminum andchrome-plated wheels, should be cleaned regularly witha mild soap and water to prevent corrosion. To removeheavy soil and/or excessive brake dust, use MOPAR Wheel Cleaner or equivalent or select a nonabrasive,non-acidic cleaner. Do not use scouring pads, steel wool,a bristle brush, or metal polishes. Only MOPAR orequivalent is recommended. Do not use oven cleaner. Avoid automatic car washes that use acidic solutions orharsh brushes that may damage the wheels’ protectivefinish. Your vehicle has plastic headlights that are lighter andless susceptible to stone breakage than glass headlights. Plastic is not as scratch resistant as glass and thereforedifferent lens cleaning procedures must be followed. To minimize the possibility of scratching the lenses andreducing light output, avoid wiping with a dry cloth. Toremove road dirt, wash with a mild soap solution followedby rinsing. Do not use abrasive cleaning components, solvents, steelwool or other aggressive material to clean the lenses. • Remove as much of the stain as possible by blottingwith a clean, dry towel. • For tough stains, apply MOPAR Total Clean orequivalent, or a mild soap solution to a clean, dampcloth and remove the stain. Use a fresh, damp towel toremove soap residue. • For grease stains, apply MOPAR Multi-PurposeCleaner or equivalent to a clean, damp cloth andremove the stain. Use a fresh, damp towel to removesoap residue. • Do not use any harsh solvents or any other form ofprotectants on Stain Repel products. The instrument panel cover has a low glare surface,which minimizes reflections in the windshield. Do notuse protectants or other products, which may causeundesirable reflections. Use soap and warm water torestore the low glare surface. if absolutely necessary. Do not use harsh cleaners orArmor All . Use MOPAR Total Clean or equivalent toclean vinyl upholstery. MOPAR Total Clean or equivalent is specifically recommendedfor leather upholstery. Your leather upholstery can be best preserved by regularcleaning with a damp soft cloth. Small particles of dirtcan act as an abrasive and damage the leather upholsteryand should be removed promptly with a damp cloth. Stubborn soils can be removed easily with a soft clothand MOPAR Total Clean or equivalent. Care should betaken to avoid soaking your leather upholstery with anyliquid. Please do not use polishes, oils, cleaning fluids,solvents, detergents, or ammonia-based cleaners to cleanyour leather upholstery. Application of a leather conditioneris not required to maintain the original condition. Many are potentially flammable, and if used inclosed areas they may cause respiratory harm. All glass surfaces should be cleaned on a regular basiswith MOPAR Glass Cleaner or any commercialhousehold-type glass cleaner. Never use an abrasive typecleaner. Use caution when cleaning the inside rear windowequipped with electric defrosters or the right rearquarter window equipped with the radio antenna. Donot use scrapers or other sharp instruments, which mayscratch the elements. When cleaning the rear view mirror, spray cleaner on thetowel or rag that you are using. Do not spray cleanerdirectly on the mirror. The lenses in front of the instruments in this vehicle aremolded in clear plastic. When cleaning the lenses, caremust be taken to avoid scratching the plastic. 1. Clean with a wet, soft rag. A mild soap solution may beused, but do not use high alcohol content or abrasivecleaners. If soap is used, wipe clean with a clean damp rag. 2. Dry with a soft tissue. Do not bleach, dye, or clean the belts with chemicalsolvents or abrasive cleaners. This will weaken the fabric. If the belts need cleaning, use a mild soap solution orlukewarm water. Do not remove the belts from the car towash them. Replace the belts if they appear frayed or worn or if thebuckles do not work properly. Dry with a soft tissue. Grab the rubber portion of the cupholder and liftupward. Soak the rubber cupholder liner in a mixture of mediumhot tap water and one teaspoon of mild liquid dish soap. Let soak for approximately one hour. After one hour pullthe liner from the water and dip it back into the waterabout six times. This will loosen any remaining debris. Rinse the liner thoroughly under warm running water. Shake the excess water from the liner and dry the outersurfaces with a clean soft cloth. Align the liner in the cupholder and press down firmly.